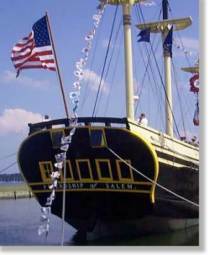 A short walk from the Visitor Center or the Peabody Essex Museum brings you to the harbor and the Salem Maritime National Historic Site maintained by the National Park Service. 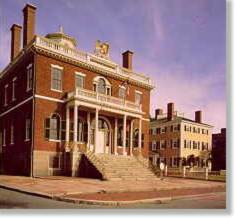 The Custom House described by Hawthorne, the Derby House (home of America's first millionaire), and the West India Goods Store, are all part of the Salem Maritime National Historic Site and are open to the public. Wharf exhibit structures are being prepared for the return from the Charlestown Nay Yard in July 2001 of the full-rigged ship, Friendship, to be berthed at the site. There is an information center beside the wharf and an attractive picnic area overlooking the harbor.